increased by 87 000 to 5.2 million, the highest level since the inception of the Quarterly Labor Force Survey in 2008. This is a shocking statistic together with yesterdays report there will be many youth who won’t be able to read and understand these statistics. See how important maths is? There are 5,7 million people without jobs some discouraged as they have been searching for so long. With so many new regulations in place the job market is a difficult place to enter, people are not employed on merit, as the saying goes it is not what you know but who you know, this becomes evident in the statistics above. We constantly hear about strikes for higher wages, yes people have the right to protest but in an orderly fashion, I don’t think they realise how the cost in damages affect them negatively. There is a huge gap betweeen the rich and the poor but if you think about it some of these people have sacrificed to where they got in life where as some keep complaining about what they don’t have. How do we combat this shocking statistic and turn it around, by actively seeking our own employment. Entrepreneurship is encouraged, be your own boss in this way you are able to employ someone else just one person makes a difference. Keep on learning, knowledge is power even if you do not have the money the libraries are free and offer internet access teach yourself, show interest in yourself, the biggest investment you can make is educating your mind. should not expect to receive.anything from the Lord. Such a person is double-minded and unstable in all they do. Let us stop complaining about we hate our jobs, long hours, crap boss etc. There are 5.7million people wishing they were in your position be thankful and count your blessings. Words of encouragement to those seeking employment your time will come keep believing and never lose hope, make your own dreams happen. And whatever you do, whether in word or deed, do it all in the name of the Lord Jesus, giving thanks to God the Father.through him. This entry was posted in Uncategorized on July 30, 2014 by shaunjengel. This is a question many of us were asked when we were younger, I remember wanting to be a Pilot, my father wanted me to be a Marine Biologist. I was in Grade 7 when a teacher asked this question and I said an Actor. I eventually chose to become an Accountant aspiring to qualify as a Chartered Accountant as well as start my own business. Why am I saying all this, well all the above careers require maths infact any career path you chose requires you to know some sort of maths whether it be an Engineer, Doctor even a ‘gaatjie’ on the taxi. Maths is all around us. I was shocked to read that more than 300 schools in the country do not offer maths to grade 12 learners because of ‘lack of demand’. We celebrate matriculant pass rates at the end of the year but is quantity really better than quality. If you look at the statistics above it means that we are producing less doctors, engineers and other qaulified people who are needed to ensure a greater economic benefit to our country. Nowadays you have to also think of being your own boss and maths is needed, think of budgets and cash flow forecasts how is your money working for you. Think geometry is not important think again, how are you going to know how to fit the maximum amount of cash in your safe to utilise all available space – answer is maths :-D.
For the life of Pi I cannot remember what COS means yes I know its a SIN but I’d rather be TANning on the beach than break my mind over that now. Ahh yes it was part of Trigonometry or rather Trickernometry as we had a crip sheet with all the formulae and this made things so much easier come exam time, draw the four quadrants fill in the signs and bobs your uncle, you are half way from solving for x.
Maths should be fun, explanation through games and visualistion the teacher should be excited about the subject, I think this is also a factor in getting more children wanting to pursue maths further as at some schools the teachers are battling with the content themselves. How do we combat this problem, start at the root develop your child from a young age emphasise the importance of maths but do not overpower them, give them the freedom of choice too. Career guidance should be a subject in all schools visualising different careers offers children the insight and allowing them to ask questions in ultimately making the right decisions for themselves. This entry was posted in Uncategorized on July 29, 2014 by shaunjengel. Walking to church this morning I was hit by a great sight that brought a smile to my face. This is the park in 5th Avenue between 4th and 5th Street, Kensington. 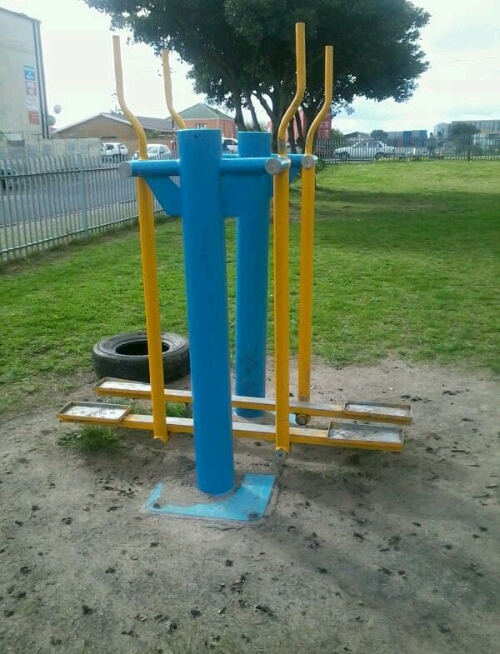 I remember jogging at around De Havilland field thinking why don’t we have those exercise machines like in Sea Point, I even tweeted the Peoples Post about it. 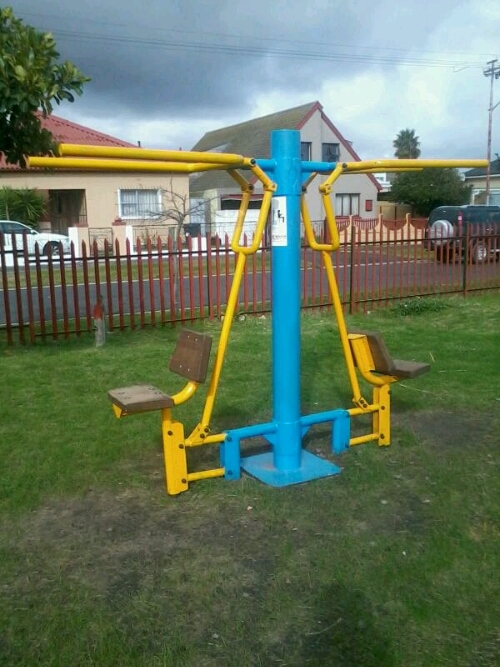 I believe a Healthy Body equals a Healthy Mind and this is what we need in our society today, there are too many influences that affect our youth and alter there minds negatively gripping them in a life of violence, drugs and gangsterism. 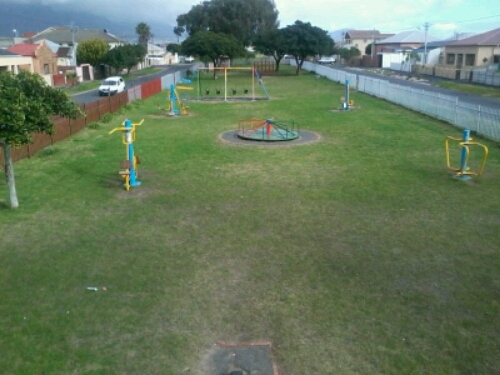 I commend projects like this as I feel it brings a type of positivity to the community, children should not live in fear, parks should be full of laughter and smiles of young people shouting and playing. I know times have changed with social networking taking us by storm but everybody still has that inner child in them I’m sure, I know I do. 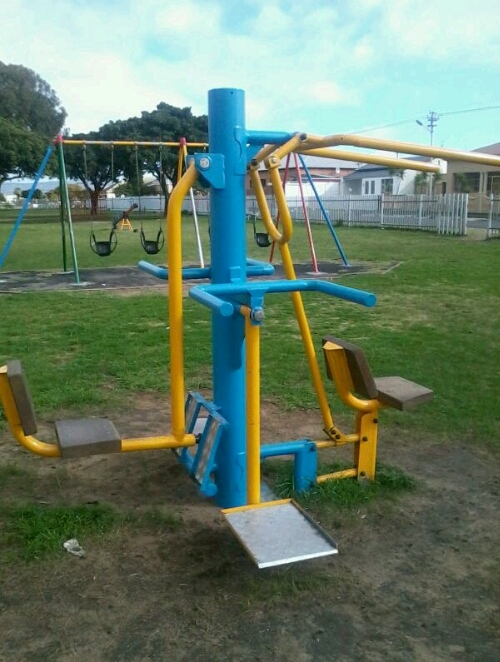 The first thing I wanted to do when I saw this was to try it out, we should encourage children to play outside more often. Fresh air and blue skies does wonders for the body and soul. I’d like to say welldone to whoever started this project, keep up the great work in uplifting our society we need more people like you. This entry was posted in Uncategorized on July 27, 2014 by shaunjengel. The Commonwealth Games are being held in Glasgow at the moment and I had a thought, why is the SABC not broadcasting this event shouldn’t we as South Africans be proud of all our sporting heroes. It is mostly Soccer, Rugby and Cricket that is being broadcast what about the other Athletes (Men and Woman) respresenting our country,being proud to be called South African and flying our Flag high – Swimming, Athletics, Judo, Table Tennis, Tennis, Golf even Ice Hockey to name but a few, we just had Richard Murray win South Africa’s first medal in the Triathalon in Glascow. Did you know that we have a BMX champion or some pretty good surfers, skateboarding and even horseriding are also sports in which we as South Africans are represented. I think we should encourage all sporting codes and not just the popular ones in order for the Youth to see what is out there and this way get interested we might just spark future heroes wearing the green and gold. Stop calling our teams “a bunch of losers” but encourage them to be a bunch of WINNERS, I don’t like seeing or reading that there is not enough money for a certain sport when in other code athletes are getting paid exorbitant salaries makes no sense. I am proud to be called South African but sometimes the system boggles my mind – 20 year democracy lets start making a difference and seeing change. This entry was posted in Uncategorized on July 24, 2014 by shaunjengel. 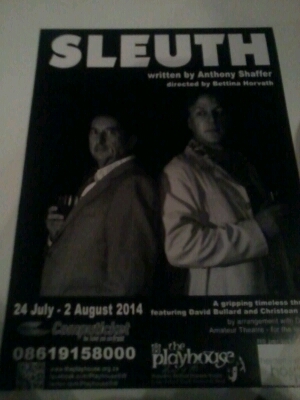 Driving towards the Playhouse Theatre in Somerset West, being invited to the final dress rehearsal of Sleuth directed by Bettina Horvath and written by Anthony Shaffer, to be honest I did not know what to expect. Like the saying goes ‘expect the unexpected’, this is definitely true for this play, (if like me you have not watched the movie), as the audience is taken on a wild ride of twists and turns all well put together by an amazing cast of David Ballard and Christoan Smit both taking their roles to another level. A gripping thriller taking you through the mind of two different personalities if not similiar, in the end it is all a game of Love vs Money. A great storyline well directed and well acted with witty dialogue and some good humour, this will really make for an awesome night out. A word of advice please bring your thinking caps, my eyes were all over the place looking for the objects after the clues were given out in Act 2….don’t know what I am talking about, well even more reason to get your ticket at Computicket and…. Game, Set and Match…I think. This entry was posted in Uncategorized on July 22, 2014 by shaunjengel. This past weekend I attended a workshop on bible study methods, this was a very interesting, blessed and fullfilling experience. It was an interactive experience as we all got an opportunity to have our say as we gathered around the scriptures written in the Bible – Faith can move mountains – we should not fear as the Lord has a plan for us all and will not fail us. The vast age groups gave us the opportunity to listen to various opinions getting different perspectives on the topics at hand, through bible study you realise that all the things that happened in the past are relevant in todays society. firmness of your faith in Christ. world, and not according to Christ. For in him the whole fullness of deity dwells bodily, and you have been filled in him,who is the head of all rule and authority. Do not let false teaching or influences affect your Faith, believe in your higher power and stand fast in this belief, we all go through phases in our life where our Faith is tested but through pray your questions will be answered. Know that you are not alone, miracles do happen – it was interesting that the day before, we went to the Kensington Shelter to deliver care packages as part of Madiba Day 67 minutes, after the worshop they catered for to many people and we dropped more bread at the Shelter – The legacy is carried forward. The spirit is Alive – Keep Believing and Standfast in your Faith. This entry was posted in Uncategorized on July 20, 2014 by shaunjengel. With today marking the 96th Birthday of The Late Madiba, he left us with a legacy of change – wanting peace and for people from all walks of life to come together, all we needed to do was give back 67 minutes of our time. – PAY IT FORWARD. I proposed that we make a care package for the less fortunate under the banner of the Maitland Moravian Youth, we gathered at the church and together as a team made sandwiches, one loaf of bread became 3 loaves as the Lord blessed our good deed. It does not matter how small of a difference you make every little counts. We contributed tin food, toiletries, sandwiches and fruit and set off to the Haven Night Shelter in Kensington to drop off our package – they were all to welcome as they need every bit that they can get in order to provide some sort of safe space for those left homeless. It was a humbling experience as we got a tour of the shelter and got to see first hand how they operate, a quick but awe inspiring experience. I noticed that it is not about the package but about the happy faces you see when they see new faces all they want is for someone to talk to them and share their experiences, I got into a conversation with one of the men at the shelter and felt like we would’ve talked for ages as he gave me a brief description of his life. If we can contribute in this way not only on the 18th July but everyday something small, a smile or a hello, how are you? These words can go a long way in building a better future for all, we all have a comfort zone and once we step out of this GREAT things are bound to happen. I thank each and everyone who contributed, time and effort in making this day happen I feel blessed and I know that we blessed a couple of people today. Lets not stop here – The sky is the limit touching lives one small step at a time. This entry was posted in Uncategorized on July 18, 2014 by shaunjengel.